Did you find that the proposition descriptions in the official booklet put you to sleep? Made you doubt your ability to grasp the ins-and-outs of economic and technical analysis? Gave you a knee-jerk reaction to support the proposition without giving it a second’s thought? Guess what? That’s what they were designed to do. The descriptive language of the official, “What’s On My Ballot?” 2018 General Election Booklet, may be a bit officially dull, sometimes a bit too technical to grasp, but it took a lot of effort to write it that way. The ballot titles and summaries have been finely crafted to be devoid of context, history, and critical analysis. They mislead Arizonans into voting against their own interests. Arizonans will fail to protect their health and the environment and will vote to enrich out-of-state energy corporations, outside private interests, and their individual in-state allies. 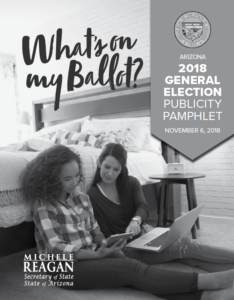 To find accurate facts about the Ballot propositions, voters should turn to the Guide jointly put out by the Arizona Advocacy Network and the League of Women Voters of Arizona at http://azballotguide.com/ This Guide gives you an accurate description of the ballot measure, its background, provisions, impact on Arizonans, summarizes arguments for and against, and most importantly lists the organizations that support and oppose the ballot measure. The presentation of Proposition 126 is a glaring example of how the official ballot proposition guide misrepresents the proposition and misleads the voters. To read the official ballot guide, you would think that Arizonans are unprotected from taxes that hurt the poor and elderly (categories which I mostly fall under), and that ordinary concerned citizens have organized to bring this proposition to the ballot to protect themselves. But Arizona already requires that the imposition of a new tax must be passed with a 2/3 majority vote. You wouldn’t know that from the official guide. Arizona is already taxing some businesses which could be called services to raise money for our roads, public schools, police, fire, and emergency services. Those taxes would not be renewed if Prop 126 is passed and we would lose that major funding source for our public institutions. It would take another amendment to the Arizona Constitution to restore that funding. But that fact is not clear in the official guide. See Approval of Prop. 126 will Cut Education and Road Funding. You wouldn’t get to know from reading the official guide that the major funders of the proposition are the Realtors Issue Mobilization Fund and the National Association of Realtors, (who, by the way, created and funded the seemingly local Citizens for Fair Tax Policy), and the so-called National Federation of Independent Businesses – a group which purports to represent the interests of small businesses, but actually promotes the interests of large corporations, has received a lot of funding in its many efforts from the Koch brothers, and counts Republican Congressman Paul Gosar among its members. Exactly is behind the measure? It matters to know what the current system for creating new tax law is, what we are already doing with taxes in that particular area and what effect the proposed amendment would have on that, and who, exactly is behind the measure, or opposing the measure. Those things are crucial pieces of information to know before deciding to vote for or against a proposition. But the Secretary of State and the Arizona Attorney General somehow don’t seem to feel that these are important facts for voters to know. Every proposition that is on the statewide ballot is presented in the official guide in language that warps the actual meaning of the proposition, buries important facts in convoluted verbiage, and altogether omits facts that are pertinent to voters making informed decisions that are in the best interests of our future. We are lucky to have the guide put out by the Arizona Advocacy Network and League of Women Voters of Arizona to give us that information in an accessible format Also read How to Vote on Arizona’s 8 Key Ballot Measures. What I really think is that Arizonans should be very angry that the Secretary of State and the Arizona Attorney General are abusing their responsibilities to Arizona voters. We should stay angry and hold them accountable for their misrepresentations. Arizonans voted to have an official guide to help them in making informed decisions. How dare the legislators and executive agencies charged with that responsibility pervert that tool to serve their special money interests?